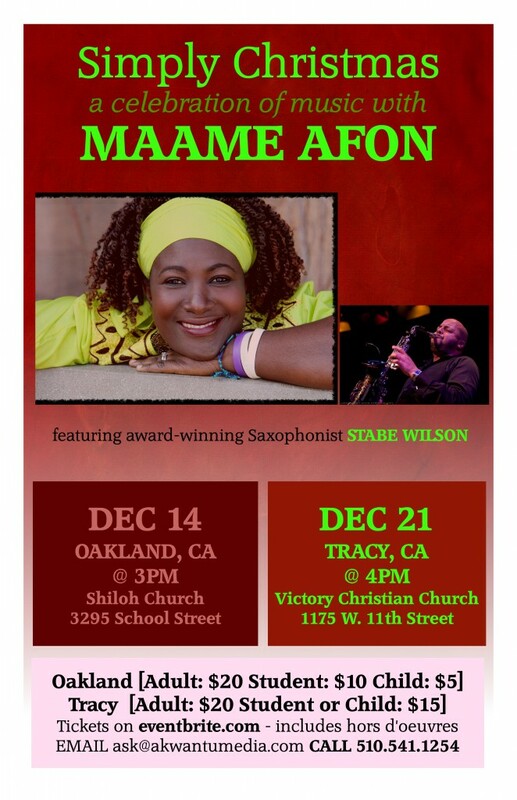 Simply Christmas – a celebration of music featuring Ghana-born Maame Afon at Shiloh Church in Oakland, CA. Maame will be backed by a team of amazing musicians from the Bay Area (Stabe Wilson on sax, Dante McClinton on drums, Tiny Lindsey on bass, Cedricke Dennis on guitar, Willis Hickerson on keys, Sangin Sara and Dale Ingram on vocals). There will be a buffet-style reception after the concert for ticket holders. Tickets can be purchased on eventbrite.com or at the door.